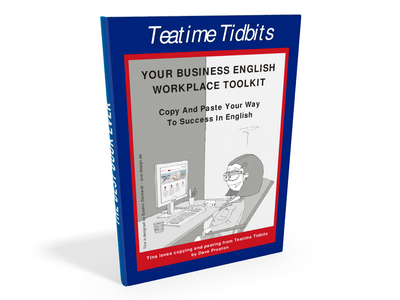 Tool & train the team with Teatime Titbits. MON. 15 – MON. 22. TOOL YOUR TEAM FOR SUCCESS IN ENGLISH WITH 1 PDF BOOK. ALL FUTURE UPDATES FOR FREE. 30 pages copy & post lists for emails, telephoning, presentations and small talk phrases. 2 pages of internet resources with descriptions & links further learning and production hack websites.